OSHA REGULATIONS REQUIRE THAT CAR BRAKES ARE APPLIED AND A WHEEL CHOCK IS IN PLACE BEFORE A CAR CAN BE SAFELY WORKED. SET THE CAR BRAKE FIRST AND THEN INSTALL THE WHEEL CHOCK. A CHOCK ALONE WILL NOT HOLD THE CAR. USE 2 CHOCKS PER CAR BEING CHOCKED. IF YOUR TRACK HAS A DIP OR HOLLOW, YOU MAY HAVE TO TAKE ADDITIONAL PRECAUTIONS. Our rail chock catalog has three sections. 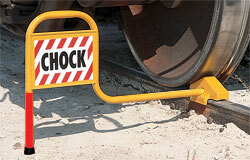 Click here for single and double rail chocks and rail car stoppers. Click here for rail skids or skates. 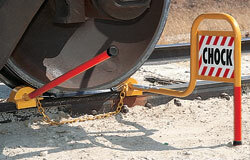 Click here for rail car wheel blocks. 2” D2000 Style 10 Aluminum Swivel Joint with Standard Bearings. 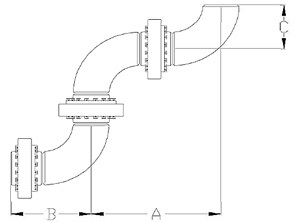 Grease Type: Standard - Dura-Lith Inlet Connection: Aluminum Buttweld Outlet Connection: Aluminum Buttweld No Seals. 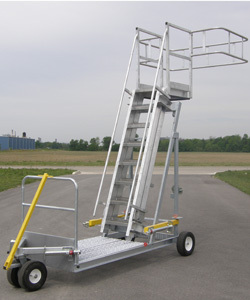 14' Truck Mobile Loading Parallel Access Platform Rolling Base 4' x 6' with 4-16" pneumatic tires No Safety Cage Adjustable stair 10'-0" to 14'-0"
2” D2000 Style 80 Aluminum Swivel Joint with Standard Bearings. 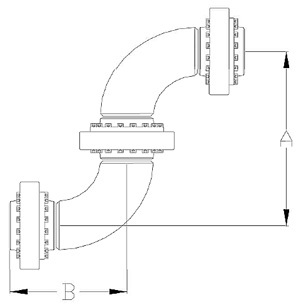 Grease Type: Standard - Dura-Lith Inlet Connection: Aluminum 300# Flange Outlet Connection: Aluminum 300# Flange No Seals. 4” D2000 Style 80 Aluminum Swivel Joint with Standard Bearings. Grease Type: Standard - Dura-Lith Inlet Connection: Aluminum TTMA Flange Outlet Connection: Aluminum TTMA Flange Buna Seals. 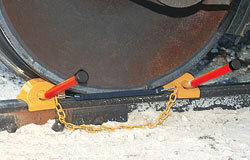 Double Exposed Rail Wheel Chock with Flag Weight 18 lbs. Double Flush Rail Rail Wheel Chock with Flag Weight 18 lbs.